At a time when awareness of the role of tropical forests in carbon storage, climate change mitigation, and biodiversity has dramatically increased, the Asner Lab seeks to rapidly advance the science of mapping forests, to support international policy discussions, and to respond with applied solutions that address on-the-ground needs for forest monitoring. 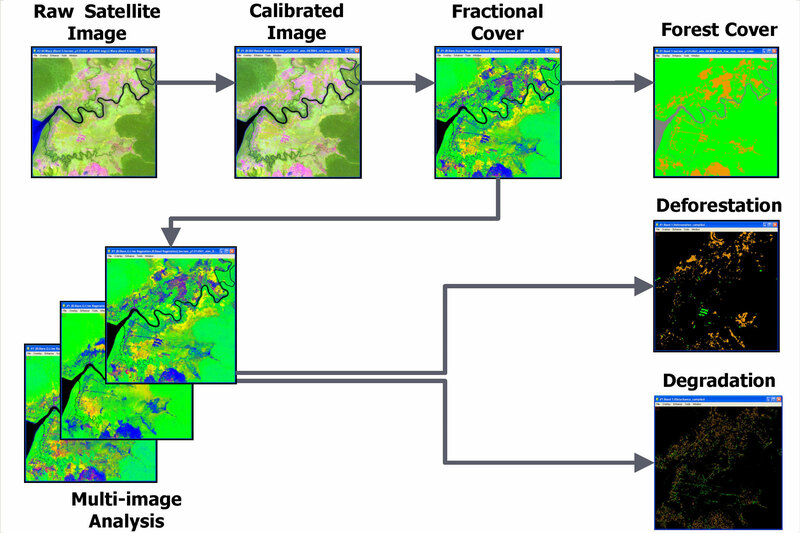 CLASlite is a software package designed for highly automated identification of deforestation and forest degradation from remotely sensed satellite imagery. Developed by Greg Asner and his team, CLASlite incorporates state-of-the-art research in remote sensing into a simple, user-friendly yet powerful tool for non-profit institutions and governments in need of technologies for forest monitoring and environmental planning. The CLASlite team’s latest effort has expanded its software capabilities and its capacity-building for regional- and national-level forest monitoring. The team is disseminating its technology through a tailored, demand-driven transference of CLASlite to government, academic and non-government (non-commercial) institutions worldwide. Via their online CLASlite training course, the team has trained individuals from more than 3000 organizations in 137 countries, making CLASlite the most widely used forest monitoring software package in the world today.